« What *is* a “successful adoption”? First off, thank you for the (hopefully non-sarcastic) compliments to my coverage of this issue. I obviously found my way over here from the link you left on the article. I have read both this response, and “Big Shiny Adoption”. 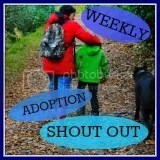 I understand your annoyance with my final comment on the issue about adoption and you have done a really good job covering exactly why you have an issue – which I respect. I would just like to comment that I actually do have at least some experience with adoption. While not adopted myself, several members of my family have adopted children, are looking to adopt children, and of course -like so many people out there- I have been very close to some people who were adopted themselves. Does this make me an expert on the subject? Not by any stretch of the imagination. My immediate “experience” with the adopted community has been generally positive, hence my generalizing, one-sided comment there at the end is admittedly skewed. As I was writing that final statement, I wanted to end the article on somewhat of a positive note. While adoption has brought a lot of joy to my family I did think about all of the actual impacts adoption has (as you covered in your other post, the financial impacts, the emotional toll it can have, etc). I chose to focus on the positive to wrap-up that post for two reasons: 1.The focus wasn’t necessarily on all that adoption entails, and 2. While having some involvement with the adoption community, I by no means have any direct involvement with it and would be far from the person who should be speaking to how lives are impacted by this in both positive and negative ways – thus, I chose to share my own thoughts brought on by my own experiences to end that article. This quote was alone worth the trip over here. I can honestly say I have never really thought of adoption in this way before. There does seem to be that attitude in society of “Hey! You have a family now! Be happy!” This certainly is not the case and I can honestly say this statement will stick with me. I am glad though, that as an adoptee yourself, that you understood that my article was about a group of people taking a line from a film out of context to find offense – not saying that “Hey, ALL adopted people, deal with it!” And, again, thank you for taking the time to write thoughtful responses to my closing comments on the subject. We don’t see this often enough in the world of anonymity we call the internet. Y’know, it’s nice to read that. There’s not many who actually admit that their “experience” is potentially colouring their perspective. I think this is why I like your post so much (iow, no, I wasn’t being sarcastic :)), even if I didn’t agree with one small bit. I’d just like to suggest, before you go, that you take a nose at this thread on the AAAFC forum, as it deals with the topic of how much other people within our families know about our own personal feelings wrt adoption.